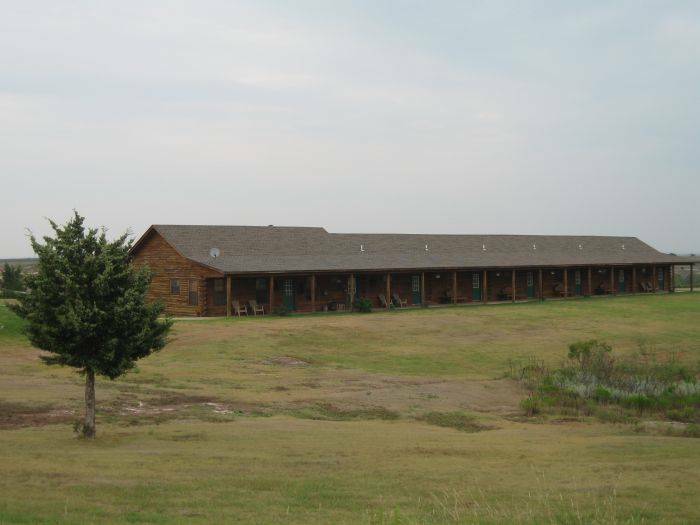 Log Construction, Large Luxurious Rooms, Front and Back Covered Porches, Restaurant on Premises, Quiet, Remote, Comfortable, Clean, Friendly People, Great Food - Located in Northwest Oklahoma between the towns of Woodward and Alva at the entrance to Alabaster Caverns State Park. Constructed in 2000. Spacious Rooms that can accomodate 4 to 6 people comfortably. 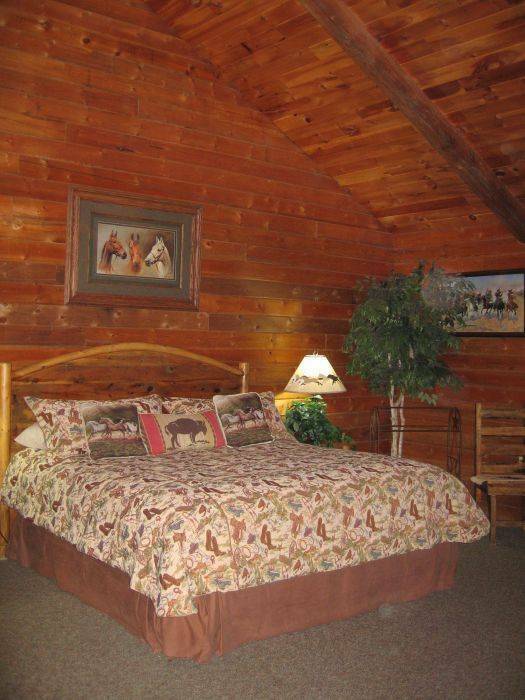 Each room features unique western furnishings and mini kitchens. Covered Porches on front and back of Lodge provide guests with panoramic views and comfortable first row seating to observe the ample wildlife that frequents the fields and canyons surrounding the lodge. If it's rest and seclusion you seek, the scenery and spacious, comfortable rooms will have you de-stressed in no time. 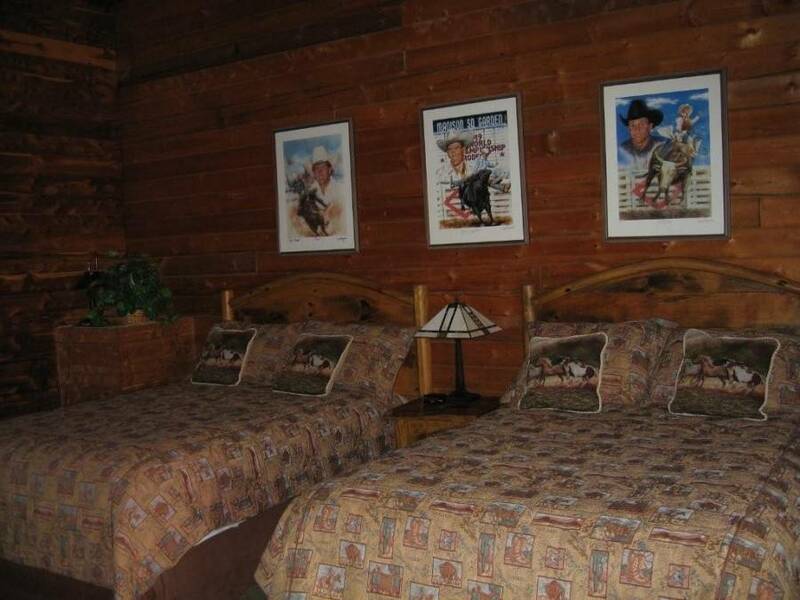 Each of the six rooms are decorated with western art and fine furnishings. If you are a "city slicker" you'll probably see more sky, stars and open space than you knew existed. Cowboys from the area wander through the restaurant. The area is known for it's cowboy influence with rodeo bulls and bucking horses roaming the surrounding lands. You'll also want to visit the nearby Town of Freedom, just six miles North. It's Main Street storefronts have been redesigned to reflect its Western heritage as an early-day cowtown. 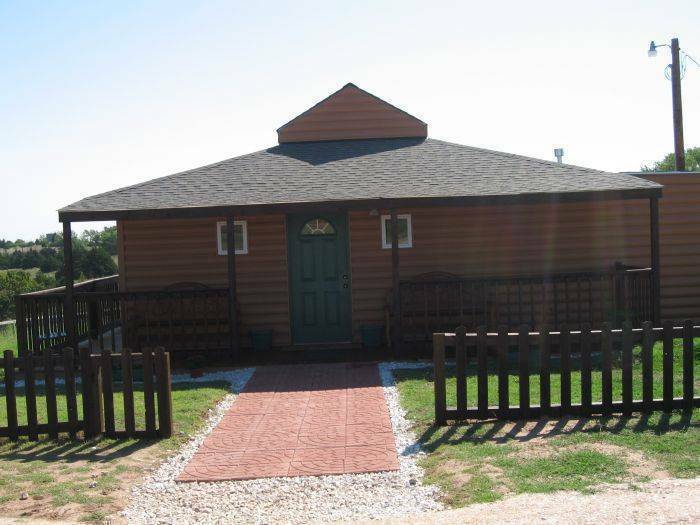 Alabaster Caverns State Park is open 363 days a year with guided tours of the caves. It also offers tent sites and RV parking. 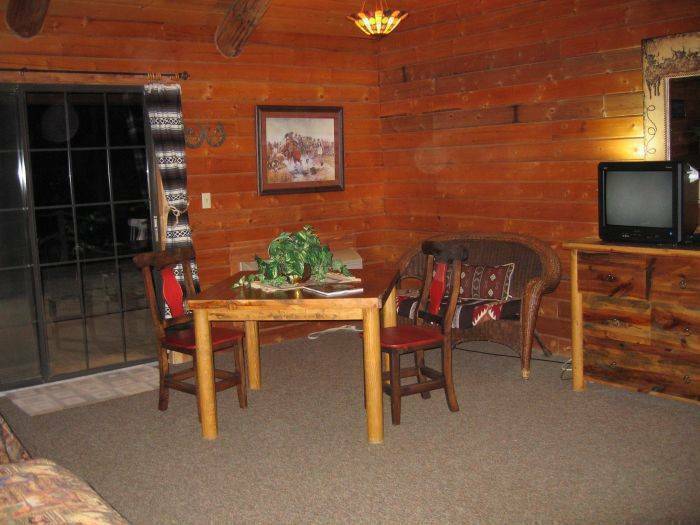 A visit to Cedar Canyon Lodge is an experience you'll long remember. People are friendly and staff always offer warm welcomes and plenty of hospitality. Enjoy a big country breakfast or fill up on the speciality steak dinner and enjoy your cold drink in a frosted mug. Visitors have said it is "Oklahoma's Best Kept Secret". Close to several State Parks offering golf, swimming, 4 wheeling (Little Sahara). Rodeo arena on property with regular rodeo events and training of bucking bulls. Weekend live music (call for schedule), caving, hiking, rock hounding, bird watching, and relaxing. Televisions in rooms. Wireless Internet available. Refrigerators, microwaves, toaster, coffee makers in rooms. Rollaways available. Pine Log and Cedar interiors. Cathedral ceilings, spacious carpeted rooms. 5 rooms with 2 queen beds and 1 room with a king. Rollaways available. Rooms can accomodate up to 6 people. Front and back covered porches with benches, ash trays for smokers (smoking not allowed in rooms). Panoramic views and peaceful existence. 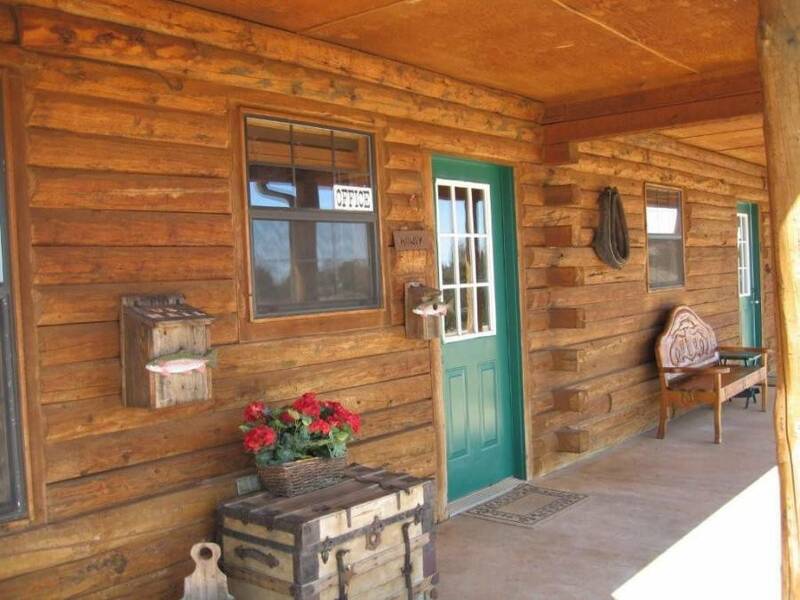 Horse trails over 40 acres of land, rodeo arena with stalls to house quests horses. Weekend local guide offers trail rides. Referrals to local hunting guides for guests. Great food at Stables Cafe with full menu from breakfast on the weekends to Steak and Chicken Fried Steak and Hamburgers, Salads, and a variety of other menu items to choose from. Beer and wine coolers available in frosted mugs. Cozy atmosphere in bar. Restaurant seats 32 with ample outside covered patio seatting to accomodate many more. Great Food. Good selection. Cold drinks, breakfast served on weekends. Payments are accepted in advance at the time of booking. Cancellations must be made 24 hours in advance for a refund. One night deposits are taken at time of booking on stays of 2 or more nights.